The stately city of culture and tourism on the Danube, on the slopes of Fruska Gora, Novi Sad, is from year to year more and more flourishing. City is reaching out to all who want to enjoy the diversity of art and civility. It represents the most important crossroads of European roads, road and rail, which contributes significantly to the industrial, cultural and economic development of the town. Today, after all the adversity that has filed a stoic, a perfect blend of history and the future, traditional and modern ways of life. Many young people call it a “student city” because it has in recent decades become a popular choice for continuing education and life after high school. Certainly because it offers great opportunities for both college choice, and for the business opportunities. What makes the city today can boast is a huge potential for tourism, the focus of a university with 10 faculties, many private colleges and vocational schools, cultural events that attract people from all over, with wonderful parks and beaches. Let’s start with the historical heritage and wealth that portray the city in the best light, namely the Danube and Petrovaradin Fortress. Just perfect together form an unbreakable whole. Petrovaradin Fortress, located on a rocky hill above the Danube, is one of the largest and best preserved fortresses in Europe, built in the Baroque military style. Beneath it are military facilities and long corridors in up to 4 levels (about 16km long), built in order to protect the army of the enemy and to be place where soldiers could live for some time. The fortress is famous for the so-called “drunk clock”, whose small hand shows minutes and large hours, to boatmen could see what time it is from afar. Clock is a tribute to the city of Empress Maria Theresa. Today, the fortress held numerous events such as the “EXIT” music festival, known throughout the world. The highest authorities of the Autonomous Province of Vojvodina are located in the building of Banovina popularly called “Marble Beauty” and “The boat on the Danube” because its facade adorned with marble stone from the island of Brac. This is one of the most monumental buildings of the modern era, built 1939. 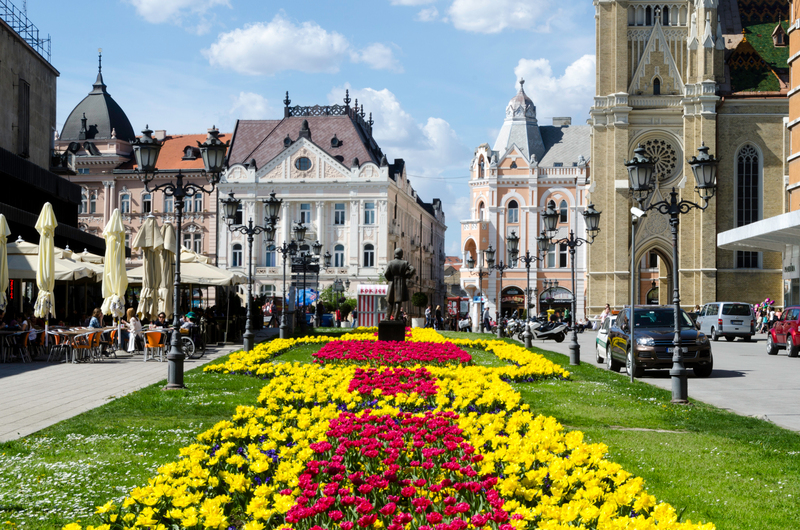 Citizens of Novi Sad are especially proud of the center of the town Liberty Square, built in the 18th century. In the center of Liberty Square there is a monument to Svetozar Miletic, and on the west side is a City Hall with a striking Ionic and Corinthian columns, a copy of townhouse in Graz. On the opposite side of the Town Hall is the Catholic Church “Name of Mary”, and there is a Hotel Vojvodina, the first purpose-built building for hotel in 1854. The reason we say that Novi Sad is the European cultural center is an institution which is the oldest of its kind in Serbia, Serbian National Theatre, founded in 1861. From the Liberty Square, where the people most commonly gather in Novi Sad, but also tourists, extends one of the oldest city streets – Zmaj Jovina Street. Locals called it “Magazinska alley” because of the many craft and trade shops. At the end of the street there is a bronze monument to Jovan Jovanovic Zmaj, the children’s poet. Another one of the oldest streets in the city is Dunavska Street with well-known Danube Park. There are Vojvodina Museum and the Historical Museum. Danube Park is still a residence for famous Serbian poets. Citizens have tried not to forget them and built monuments to Djura Jaksic, Miroslav Antic i Branko Radicevic. Although the town is very lively during the day, also live at night. A variety of clubs, bars, restaurants and rafts makes the city an ideal place to spend the festivities until the early morning hours. Fans of the national cuisine have a wide range of restaurants, from local ones to the French, Chinese and Indian.